Counting is an integral part of data analysis, whether you are tallying the head count of a department in your organization or the number of units that were sold quarter-by-quarter. 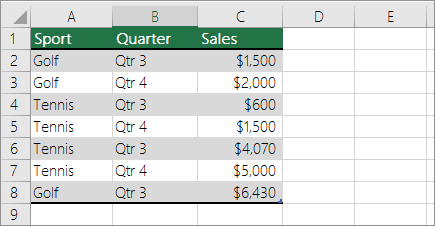 Excel provides multiple techniques that you can use to count cells, rows, or columns of data. To help you make the best choice, this article provides a comprehensive summary of methods, a downloadable workbook with interactive examples, and links to related topics for further understanding. Note: Counting should not be confused with summing. 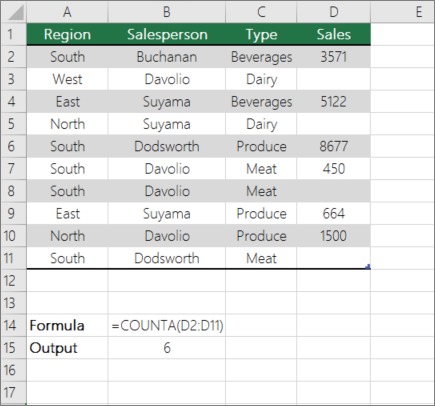 For more information about summing values in cells, columns, or rows, see Summing up ways to add and count Excel data. You can download an example workbook that gives examples to supplement the information in this article. Most sections in this article will refer to the appropriate worksheet within the example workbook that provides examples and more information. You can count the number of values in a range or table by using a simple formula, clicking a button, or by using a worksheet function. 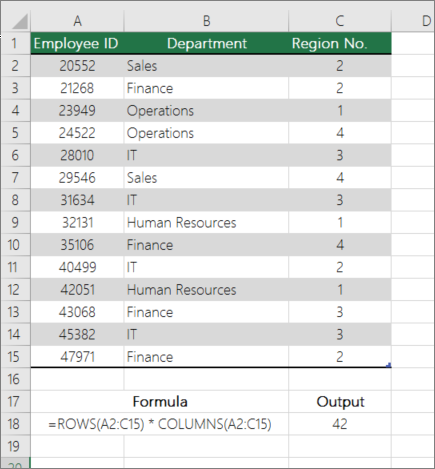 Excel can also display the count of the number of selected cells on the Excel status bar. See the video demo that follows for a quick look at using the status bar. Also, see the section Displaying calculations and counts on the status bar for more information. You can refer to the values shown on the status bar when you want a quick glance at your data and don't have time to enter formulas. Watch the following video to learn how to view count on the status bar. Use AutoSum by selecting a range of cells that contains at least one numeric value. Then on the Formulas tab, click AutoSum > Count Numbers. Excel returns the count of the numeric values in the range in a cell adjacent to the range you selected. Generally, this result is displayed in a cell to the right for a horizontal range or in a cell below for a vertical range. 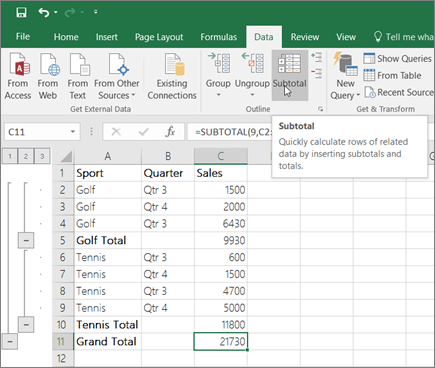 You can add a subtotal row to your Excel data. Click anywhere inside your data, and then click Data > Subtotal. Note: The Subtotal option will only work on normal Excel data, and not Excel tables, PivotTables, or PivotCharts. Use the SUBTOTAL function to count the number of values in an Excel table or range of cells. If the table or range contains hidden cells, you can use SUBTOTAL to include or exclude those hidden cells, and this is the biggest difference between SUM and SUBTOTAL functions. To include hidden values in your range, you should set the function_num argument to 2. To exclude hidden values in your range, set the function_num argument to 102. You can count the number of cells in a range that meet conditions (also known as criteria) that you specify by using a number of worksheet functions. Watch the following video to see how to use the COUNT function and how to use the COUNTIF and COUNTA functions to count only the cells that meet conditions you specify. Use the COUNT function in a formula to count the number of numeric values in a range. In the above example, A2, A3, and A6 are the only cells that contains numeric values in the range, hence the output is 3. Note: A7 is a time value, but it contains text (a.m.), hence COUNT does not consider it a numerical value. If you were to remove a.m. from the cell, COUNT will consider A7 as a numerical value, and change the output to 4. Use the COUNTIF function function to count how many times a particular value appears in a range of cells. DCOUNT function counts the cells that contain numbers in a field (column) of records in a list or database that match conditions that you specify. 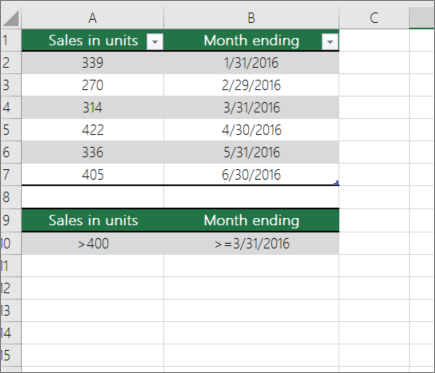 In the following example, you want to find the count of the months including or later than March 2016 that had more than 400 units sold. 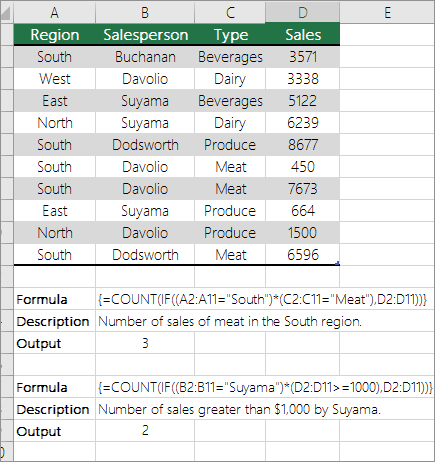 The first table in the worksheet, from A1 to B7, contains the sales data. DCOUNT uses conditions to determine where the values should be returned from. 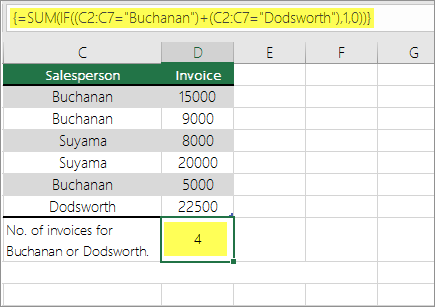 Conditions are typically entered in cells in the worksheet itself, and you then refer to these cells in the criteria argument. In this example, cells A10 and B10 contain two conditions—one that specifies that the return value must be greater than 400, and the other that specifies that the ending month should be equal to or greater than March 31st, 2016. 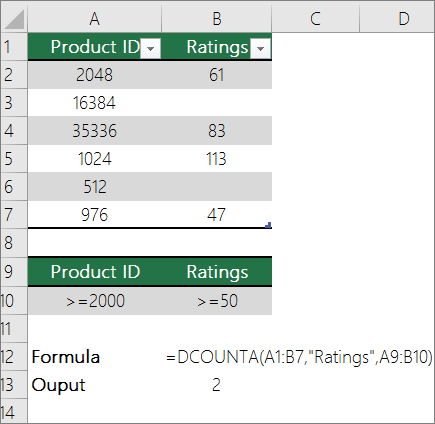 DCOUNT checks the data in the range A1 through B7, applies the conditions specified in A10 and B10, and returns 2, the total number of rows that satisfy both conditions (rows 5 and 7). Important: The formulas in this example must be entered as array formulas. That means you press F2 and then press Ctrl+Shift+Enter. In earlier versions of Excel for Mac use +Shift+Enter. A PivotTable summarizes your data and helps you analyze and drill down into your data by letting you choose the categories on which you want to view your data. 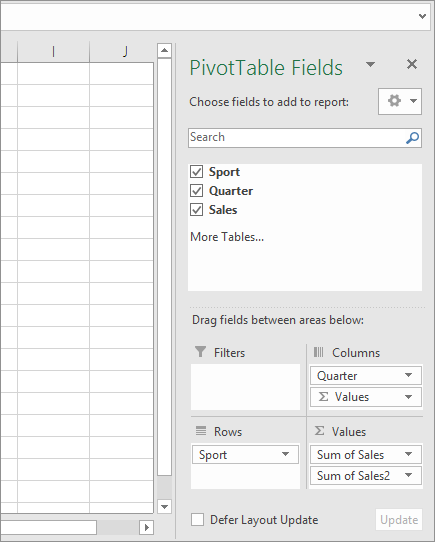 You can quickly create a PivotTable by selecting a cell in a range of data or Excel table and then, on the Insert tab, in the Tables group, clicking PivotTable. 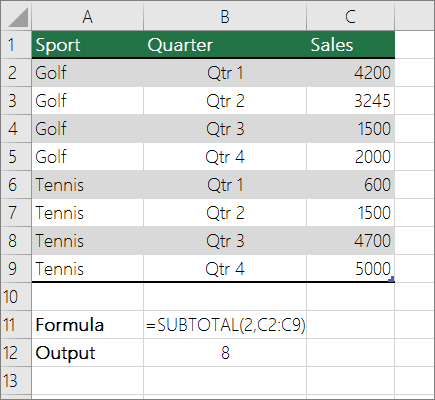 Let's look at a sample scenario of a Sales spreadsheet, where you can count how many sales values are there for Golf and Tennis for specific quarters. 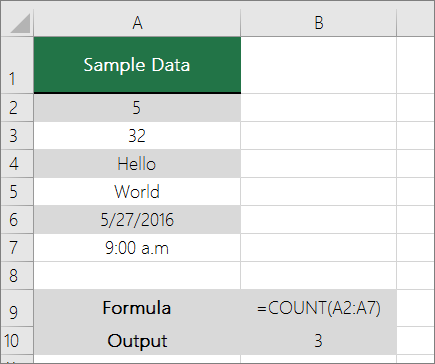 Note: For an interactive experience, you can run these steps on the sample data provided in the PivotTable sheet in the downloadable workbook. 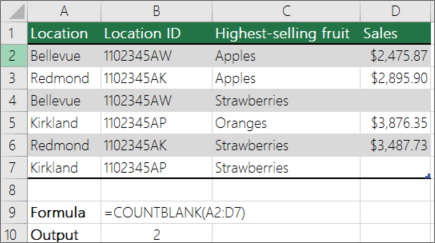 You can count cells that either contain data or are blank by using worksheet functions. Use the COUNTA function function to count only cells in a range that contain values. When you count cells, sometimes you want to ignore any blank cells because only cells with values are meaningful to you. For example, you want to count the total number of salespeople who made a sale (column D). COUNTA ignores the blank values in D3, D4, D8, and D11, and counts only the cells containing values in column D. The function finds six cells in column D containing values and displays 6 as the output. Use the DCOUNTA function to count nonblank cells in a column of records in a list or database that match conditions that you specify. The following example uses the DCOUNTA function to count the number of records in the database that is contained in the range A1:B7 that meet the conditions specified in the criteria range A9:B10. Those conditions are that the Product ID value must be greater than or equal to 2000 and the Ratings value must be greater than or equal to 50. DCOUNTA finds two rows that meet the conditions- rows 2 and 4, and displays the value 2 as the output. 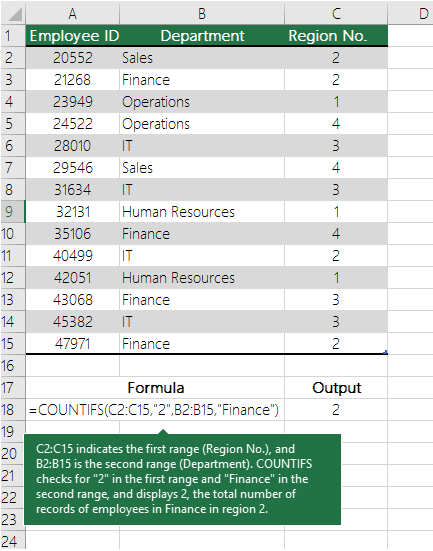 Use the COUNTBLANK function function to return the number of blank cells in a contiguous range (cells are contiguous if they are all connected in an unbroken sequence). If a cell contains a formula that returns empty text (""), that cell is counted. When you count cells, there may be times when you want to include blank cells because they are meaningful to you. In the following example of a grocery sales spreadsheet. suppose you want to find out how many cells don't have the sales figures mentioned. 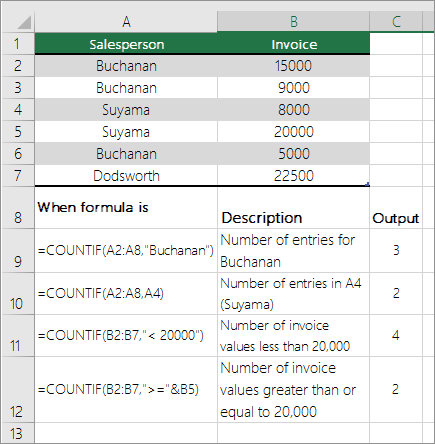 Note: The COUNTBLANK worksheet function provides the most convenient method for determining the number of blank cells in a range, but it doesn't work very well when the cells of interest are in a closed workbook or when they do not form a contiguous range. The Knowledge Base article XL: When to Use SUM(IF()) instead of CountBlank() shows you how to use a SUM(IF()) array formula in those cases. Use a combination of the SUM function and the IF function. 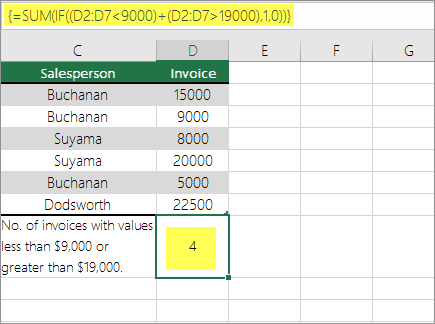 In general, you do this by using the IF function in an array formula to determine whether each referenced cell contains a value, and then summing the number of FALSE values returned by the formula. See a few examples of SUM and IF function combinations in an earlier section Count how often multiple text or number values occur by using the SUM and IF functions together in this topic. 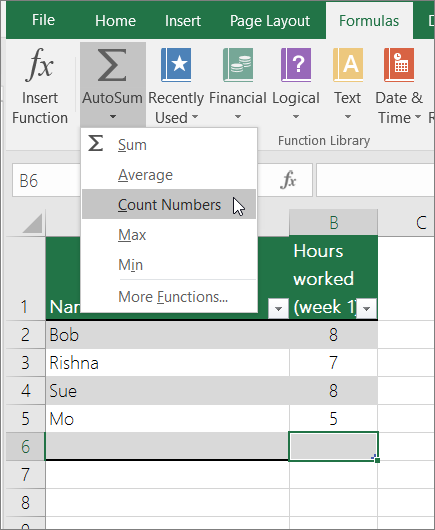 You can count unique values in a range by using a PivotTable, COUNTIF function, SUM and IF functions together, or the Advanced Filter dialog box. 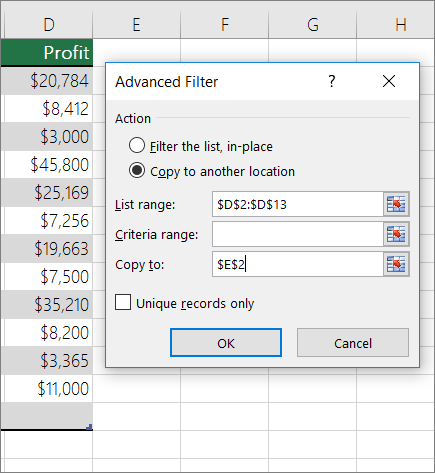 Use the Advanced Filter dialog box to find the unique values in a column of data. You can either filter the values in place or you can extract and paste them to a new location. Then you can use the ROWS function to count the number of items in the new range. To use Advanced Filter, click the Data tab, and in the Sort & Filter group, click Advanced. The following figure shows how you use the Advanced Filter to copy only the unique records to a new location on the worksheet. 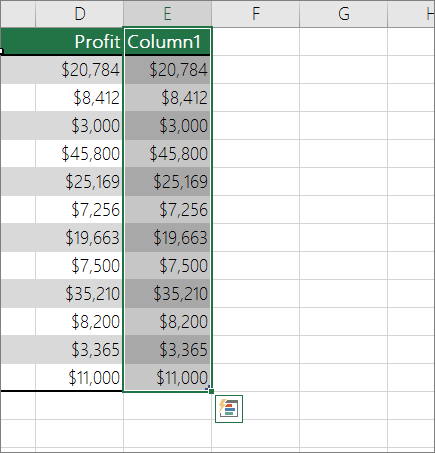 In the following figure, column E contains the values that were copied from the range in column D.
If you filter your data in place, values are not deleted from your worksheet — one or more rows might be hidden. Click Clear in the Sort & Filter group on the Data tab to display those values again. If you only want to see the number of unique values at a quick glance, select the data after you have used the Advanced Filter (either the filtered or the copied data) and then look at the status bar. The Count value on the status bar should equal the number of unique values. Use various combinations of the IF, SUM, FREQUENCY, MATCH, and LEN functions. For more information and examples, see the section "Count the number of unique values by using functions" in the article Count unique values among duplicates. Also, see the article XL: How to determine the number of unique items in a list. You can count the number of cells or the number of words in a range by using various combinations of worksheet functions. Now, for the above formula to work correctly, you have to make this an array formula, otherwise the formula returns the #VALUE! error. To do that, click on the cell that has the formula, and then in the Formula bar, press Ctrl + Shift + Enter. 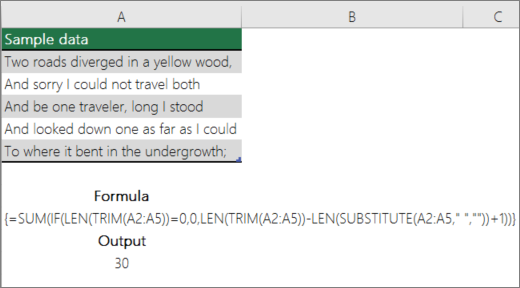 Excel adds a curly bracket at the beginning and the end of the formula, thus making it an array formula. For more information on array formulas, see Overview of formulas in Excel and Create an array formula. When one or more cells are selected, information about the data in those cells is displayed on the Excel status bar. 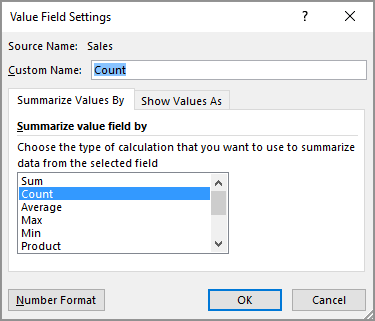 For example, if four cells on your worksheet are selected, and they contain the values 2, 3, a text string (such as "cloud"), and 4, all of the following values can be displayed on the status bar at the same time: Average, Count, Numerical Count, Min, Max, and Sum. Right-click the status bar to show or hide any or all of these values. These values are shown in the illustration that follows. Do you have a specific Excel question?